To mark ten years of brewing in Red Hill, Karen and David Golding and their team are brewing ten different red beers. Each will feature artwork by a different local artist, with beer number one – The Bloody Plums – featuring some colourful work by Nick Kallincos. 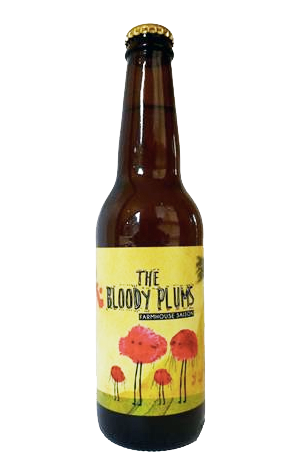 It also features plums from the big plum tree that is part of the farm on the Mornington Peninsula where they've been welcoming guests since 2005. It's not the reddest of beers, but definitely has a tinge of blood orange to its cloudy body. Given they're using fruit from their farm, they've opted for a farmhouse style of beer – a saison, to be precise – and one that, with its full body and sweet, rich honey malt aromas that rise from the glass, is kind of reminiscent of other big Belgians (this tips the scales at 7.5 percent) from the Red Hill stable. The saison yeast lends the beer some spicy complexity and there's a touch of fruity (plummy) tartness shooting through the middle too. You can keep social tabs on this and the nine beers to follow using the tags #theredproject #10yearsofbeer #10redbeers #10redbeards – presumably if you're brewing ten red beers you're well within your rights to have as many hashtags as you like!